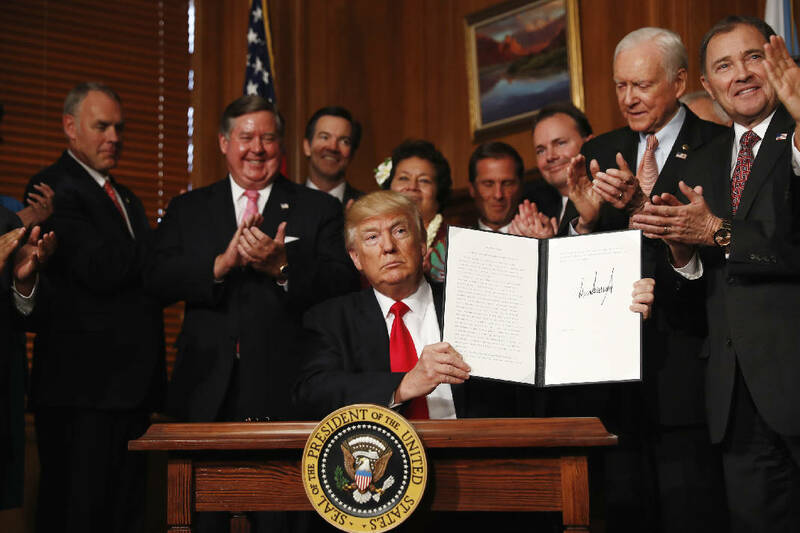 WASHINGTON — President Donald Trump signed an executive order Wednesday directing his interior secretary to review the designation of dozens of national monuments on federal lands, as he singled out "a massive federal land grab" by the Obama administration. It was yet another executive action from a president trying to rack up accomplishments before his first 100 days in office, with Saturday marking that milestone. The latest move could upend protections put in place in Utah and other states under a 1906 law that authorizes the president to declare federal lands as monuments and restrict their use. During a signing ceremony at the Interior Department, Trump said the order would end "another egregious abuse of federal power" and "give that power back to the states and to the people where it belongs." Trump accused the Obama administration of using the Antiquities Act to "unilaterally put millions of acres of land and water under strict federal control" — a practice Trump derided as "a massive federal land grab." "Somewhere along the way the Act has become a tool of political advocacy rather than public interest," Interior Secretary Ryan Zinke said. "And it's easy to see why designations in some cases are viewed negatively by those local communities that are impacted the most." In December, shortly before leaving office, President Barack Obama infuriated Utah Republicans by creating the Bears Ears National Monument on more than 1 million acres of land that's sacred to Native Americans and home to tens of thousands of archaeological sites, including ancient cliff dwellings. Republicans in the state asked Trump to take the unusual step of reversing Obama's decision. They said the designation will stymie growth by closing the area to new commercial and energy development. The Antiquities Act does not give the president explicit power to undo a designation and no president has ever taken such a step. Trump's order was one of a handful he intended to sign this week in a flurry of developments before his 100th day in office. The president has used executive orders aggressively over the past three months; as a candidate, Trump railed against Obama's use of this power. Wednesday's order will cover several dozen monuments across the country designated since 1996. They total 100,000 acres or more and include the Grand Staircase-Escalante National Monument and Bear Ears, both in Utah. Zinke said that over the past 20 years, the designation of tens of millions of acres as national monuments have limited the lands' use for farming, timber harvesting, mining and oil and gas exploration, and other commercial purposes. While designations have done "a great service to the public," Zinke said the "local community affected should have a voice." Some, including Sen. Orrin Hatch, R-Utah, have hailed the order as the end of "land grabs" by presidents dating to Bill Clinton. But Sen. Martin Heinrich, D-N.M., said that if Trump truly wants to make America great again, he should use the law to protect and conserve America's public lands. In New Mexico, Obama's designation of Rio Grande del Norte National Monument and Organ Mountains-Desert Peaks National Monument have preserved important lands while boosting the economy, Heinrich said, and that story has repeated across the country. "If this sweeping review is an excuse to cut out the public and scale back protections, I think this president is going to find a very resistant public," Heinrich said. Leaders of the Bears Ears Inter-Tribal Coalition called Trump's action "extremely troubling." "It is offensive for politicians to call the Bears Ears National Monument 'an abuse,'" said Shaun Chapoose, chairman of the Ute Indian Tribe Business Committee. "To the contrary, it is a fulfillment of our duty to preserve our cultures and our ancestral lands, and its designation was the result of a long, deliberative process to fight for our ancestors as well as access for contemporary use of the lands by our tribal members."